A pawnbroker offers loans secured by personal property. In most cases, the property used as collateral will remain with the pawnbroker until the loan and its associated costs have been fully repaid. In this way, this type of loan differs from loans where the borrower remains in possession of the property used as collateral, e.g. the house for a home mortgage loan or the car for a car loan. The term pawn comes from the Latin word pignus, which means pledge. What can I use as collateral at the pawnshop? It is up to the individual pawnbroker to decide if an item will be accepted as collateral or not (within the limits of applicable law, of course). An item refused by one pawnbroker might therefore be accepted by another. The valuation of an item can also very greatly between pawnbrokers, especially for unusual objects. How much can a borrow from a pawnbroker? This depends on the valuation of the collateral and the policy of the individual pawnbroker. Many pawnbrokers have an upper limit for their loans, even if you can offer really valuable collateral. Some can even be unwilling to accept a very expensive item as collateral for a small loan, since such a precious item wouldn’t be covered by the pawnbroker’s insurance policy and might be difficult to sell through the pawnbroker’s normal selling channels. There are however certain pawnbrokers that specializes in providing very large loans and accept high-value collateral. Often, they don’t call themselves pawnbrokers or pawnshops. Instead, they are “high-end collateral lenders” or something along those lines. 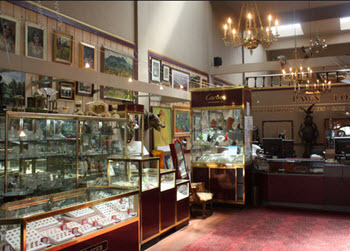 This type of high-end pawnshops began to appear in the early 1900s when ordinary pawnshops had developed a dodgy reputation and upscale clients pawning the family jewels didn’t want to set foot at such establishments. True to their origin, many high-end pawnshops are very discrete. While the small-loan pawnshop might be located in the stripmall, using neon lights to advertise that they will give you CASH FOR GOLD – GUNS – GUITARS, upscale pawnbrokers are more likely to operate out of an office in an ordinary office building without any display windows or other attention grabbing stuff. They also have the necessary insurance and storage facilities to accept wine collections, fine art, famous high-end jewellery, and more. What happens if I don’t pay back the loan on time? If you don’t pay back the money you owe the pawnbroker on time, the pawnbroker have the right to sell the item to recover the money. The exact rules regarding the selling of pawned objects vary from one jurisdiction to another, so it is important that you find out which rules that pertain to the pawnbroker you are thinking about using. 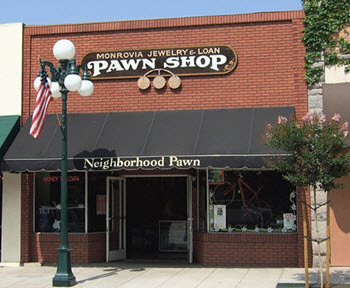 In some countries and states, the pawnbroker is legally obliged to pay you back the difference if the item sells for more than you owe the pawnbroker (including certain costs pertaining to the sale). In some countries and states, there is a mandatory waiting period between the agreed payback date and the date when the pawnbroker is allowed to sell the pawned object. During this waiting period, the borrower can get the object back by repaying the owed money in full + a special fee or interest. Many pawnshops will agree to not sell the pawned item as long as you continuously pay the interest on your loan, even if you can’t pay back the principal. This will of course become very expensive over time, since pawnshops tend to charge a rather high interest rates. The good thing is that you can stop paying at any time. Yes, you will lose your pawned object, but you won’t be saddled with a mountain of debt. Since the loan is secured by personal property, there is no need for the pawnshop to do a credit check on you or even ask for information about your financial situation before they lend you money. A pawnshop can therefore be an especially good alternative to unsecured loans if you have a low credit score or if you wish to not have a credit check appear on your credit score. Another great thing about borrowing from a pawnshop is that failing to repay the loan on time won’t impact your credit score, and can’t send you down a debt spiral. With unsecured debt, any unpaid principal will keep on costing you in the form of interest. If you don’t pay down the interest, it will be added to the principal, increasing the among on which interest must be paid. Soon, a fairly small initial loan can turn into a mountain of debt. Providers of unsecured loans may also have a clause in their T&C that allows them to sharply increase the interest rate if your credit worthiness drops – and it will certainly drop when you fail to pay them. This is not something you have to worry about when you borrow from a pawnshop. If you fail to repay them, you lose the pawned item – and that’s all. Before you pawn something, consider selling something instead to get the money you need. Many pawnshops are also licensed second-hand dealers that buy objects on the spot, and you get cash in hand – just as when you borrow. Selling is often better than pawning, since you don’t have to pay interest and fees. It will also make you more picky when selecting the item. When we pawn something, we like to tell ourselves that we will have no problem paying back the loan quickly and get our property back. This makes us willing to pawn things that we really don’t want to part with, e.g. items of great sentimental value. When we fail to pay back, it hurts a lot since we lose an item that was precious to us. If you decide right from the start to sell an item to get the necessary money, you know that you need to pick something that you are okay with letting go of.